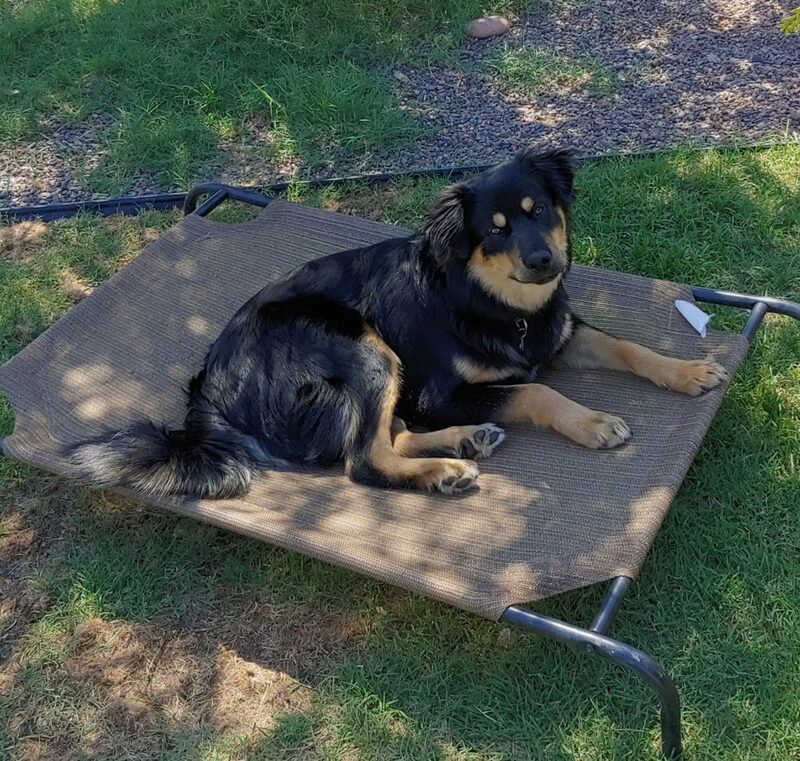 Carl and Deanna, from Tempe, AZ, signed up Rugger and Rossie, their Belgian Tervurens, for our boarding school program when the dogs became a little more than they felt they could handle. Rugger and Rossie would bark and lunge at the other dogs and people during walks in the neighborhood and they would jump on people when they entered into their home. 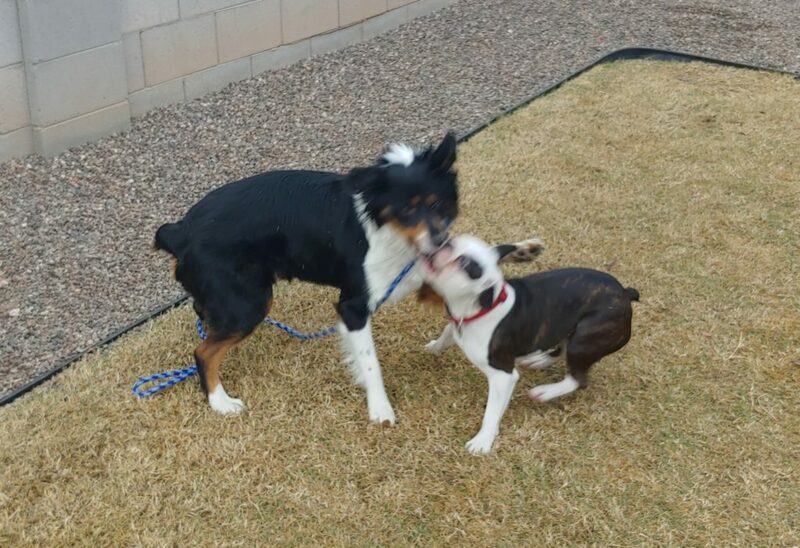 Rugger and Rossie would also bark at a lot of different noises when they were inside their home and fed off of each other’s energy when they got over excited about something. Carl and Deanna were not sure how to handle this because they were not even able to get the dogs to go inside of a crate let alone be able to have them respond to commands. Rugger and Rossie stayed for our boarding school program at different times so they could interact with other dogs and learn to be polite and engage with as many dogs and people as possible. 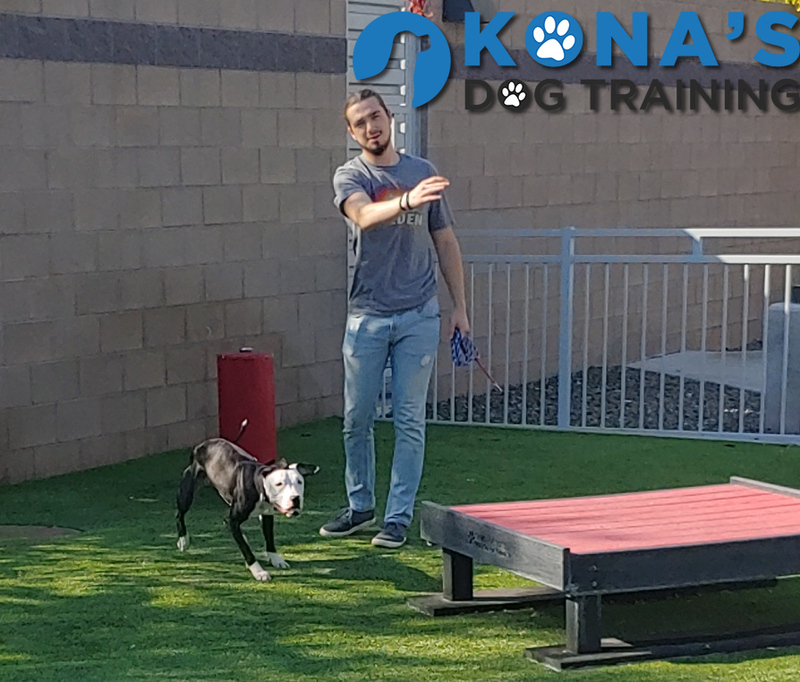 Both dogs improved tremendously during the stay and they would listen better to commands, like “come”, “place” and “down” as well as walk nicely on leash, even with other dogs or people around. They each learned to love their own crate during their stay and now spend quality time in them while their family does daily activities. 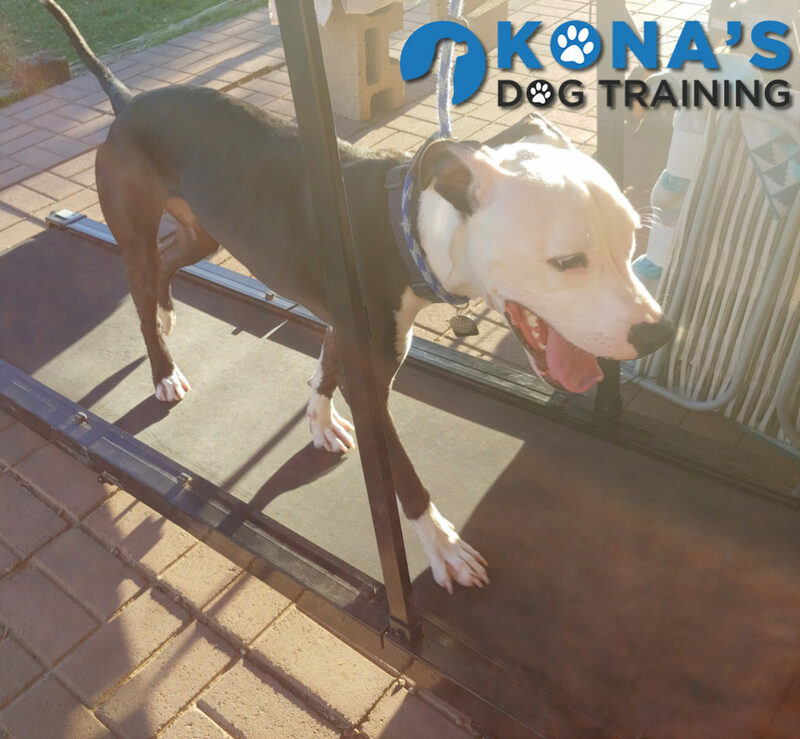 how to walk on the treadmill inside their house, so during those hot summer days Rugger and Rossie can still get great exercise. I wonder how much more these two will learn in the future. 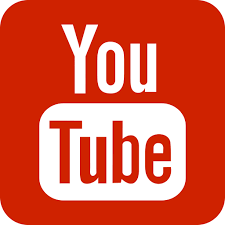 Maybe tightrope?…maybe not! 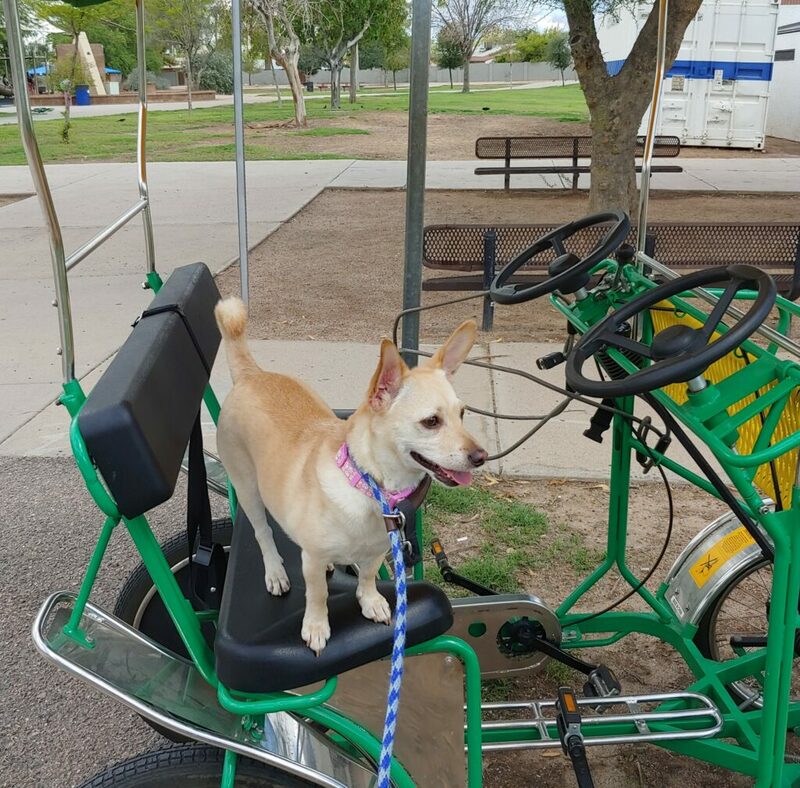 Ana, from Mesa, AZ called us after Peanut, her Corgi – Chihuahua mix had snapped and bit her friend during a house party. 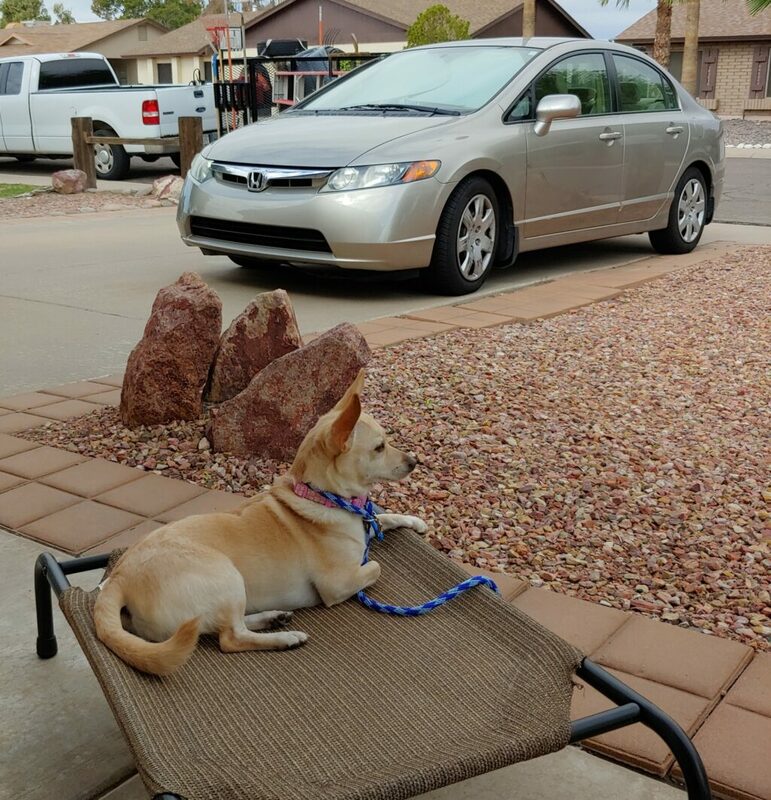 Peanut also lunged while on the leash and barked and growled at people when they walked by and inside her home. Ana was very worried that Peanut was aggressive and couldn’t be around people. She needed help and training to see if Peanut was able to be a friendly confident dog, rather than a fear biter. When Ana set up her visit with us, she was so surprised that Peanut didn’t initially lunge, bark and growl when she first met us. Peanut actually warmed up very quickly and was even confident enough to approach and smell. She even responded well to touch and talk. 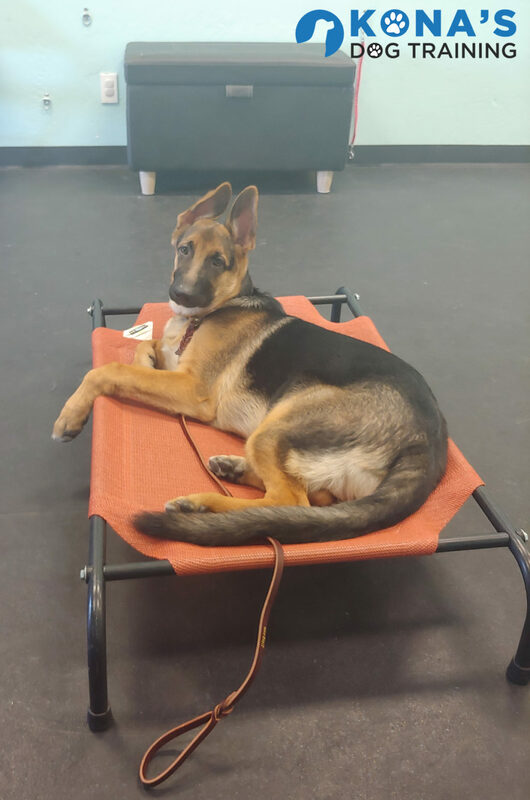 Ana signed Peanut up for our Advanced Boarding School program, were she stayed with us for four weeks and learned everything from manners, leash walking nicely and socializing with other dogs and people too. After a couple of days Peanut was already skilled in general obedience and would respond to verbal commands. 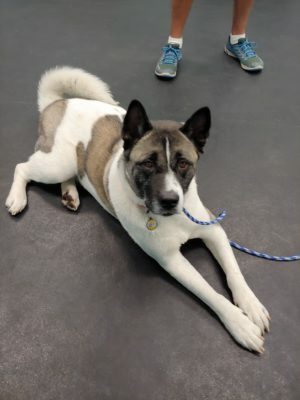 After that we focused her training on getting her out in public, going to brunch and Home Depot as well as our local parks and places where people and dogs frequented often. Eventually Peanut went everywhere and calmed down so much that people complemented her on her behavior. People had no idea she was once a dog who was afraid and uncomfortable to be around people. Peanut made her biggest progress while playing and interacting with other dogs. She learned very quickly that she was allowed to voice her opinion about how other dogs could interact with her; that she was allowed to say “no” and learned that many dogs respect that. She then realized that she didn’t need to be loud to communicate. 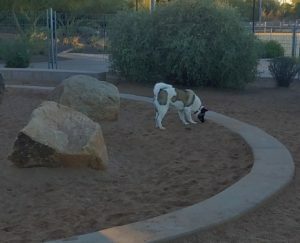 She stopped barking around other dogs and very simply let out a small growl to let other dogs know she needed a little space. She eventually warmed up so well that she started to play and engage with them. to build both of their confidence. They are striving to have the next 10 plus years be the best! 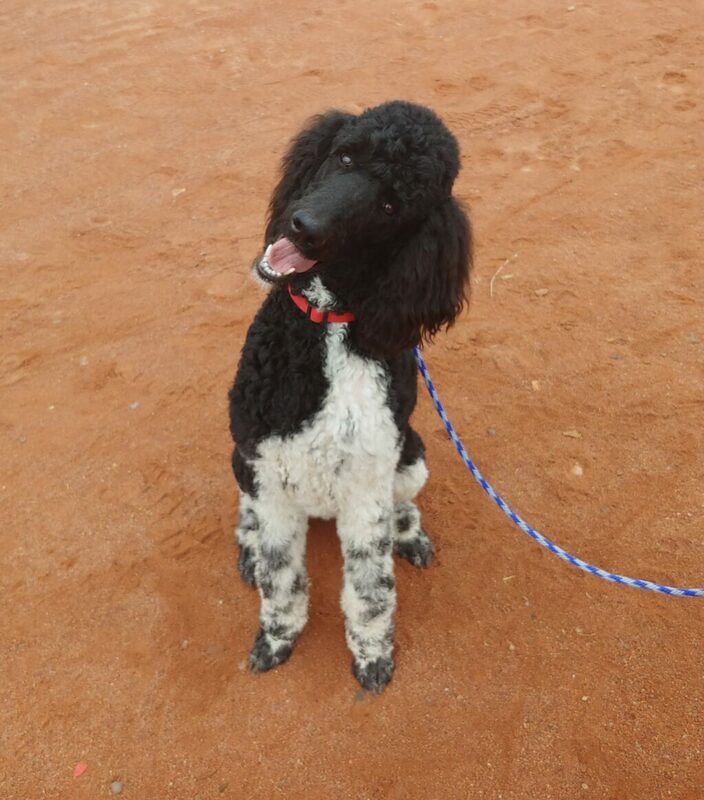 Karen, from Mesa, AZ called us to see if Bodhi, her 8 month old standard poodle would be a good candidate for work as her service dog. We scheduled a visit to talk everything over and see if he might have the personality for service work. Well, when they arrived I questioned Bodhi’s age almost immediately since he was a very calm, relaxed and well- mannered poodle who sat next to Karen almost the entire time we talked. Bodhi was curious, but not over excited about the facility and he engaged with me when I encouraged interaction. Karen and I talked for a while and I then found out that she was having some trouble with him while on leash and coming when called. Bodhi was too happy to see people out on walks and would pull slightly on leash. While his pulling was not what most people were used to it was hard on Karen, whose health isn’t the greatest. Bodhi also listened sporadically inside the home, not listening to commands regularly. Karen decided to sign Bodhi up for our Unlimited Program as well as having him stay with us for boarding while she traveled back to Kansas. We knew to even consider service work, we would have to get his excitement in public down and get him to listen consistently in all types of environments. Karen was so happy to get the guidance she needed to work with Bodhi. She practiced every day and constantly came back to lessons sharing her progress. Bodhi started to walk much nicer on leash only after a few days of our first lesson and would consistently come when called after the third. 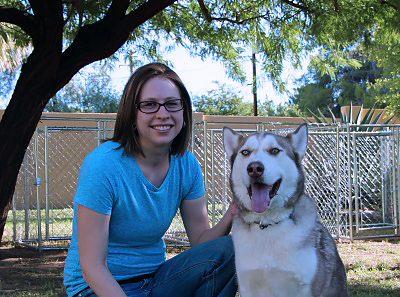 Karen loves spending her days interacting with Bodhi and building their relationship. Service work is just around the corner. 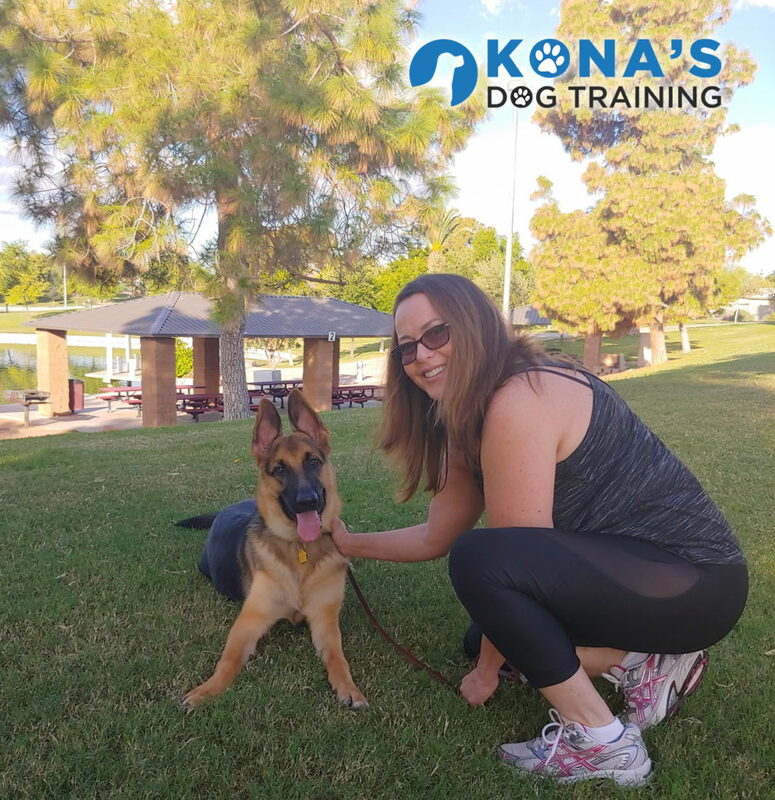 Karen has even moved one step further with Bodhi’s training, working him with an electronic collar to get long distance coming when called better. 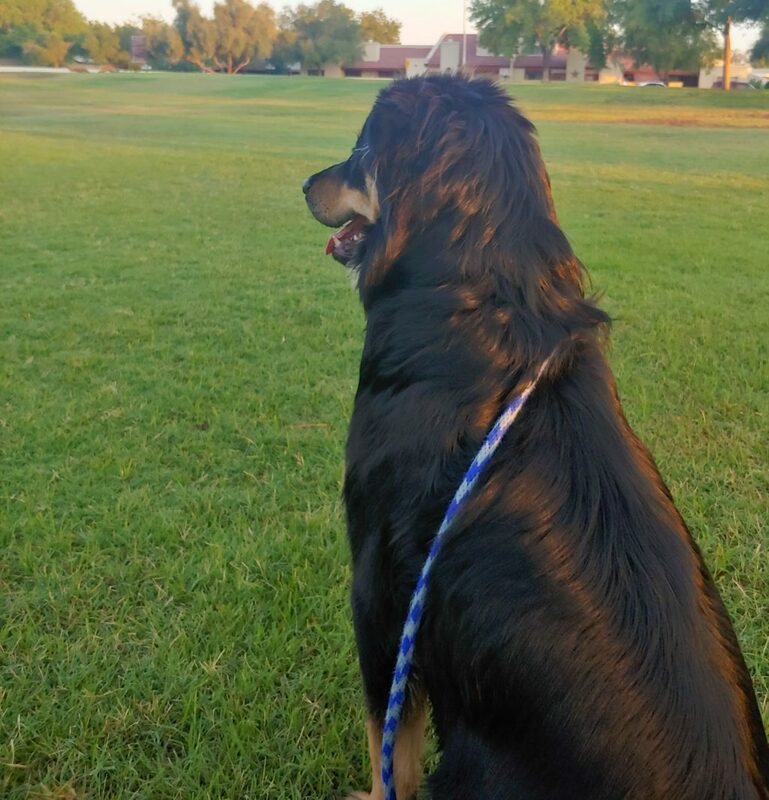 Karen wants Bodhi to have the freedom of all the acres she has in Kansas, but with the reliability of knowing that even when he can’t hear her that he should still “check in” when the collar is used. This way she doesn’t have to worry about Bodhi getting lost or not listening. 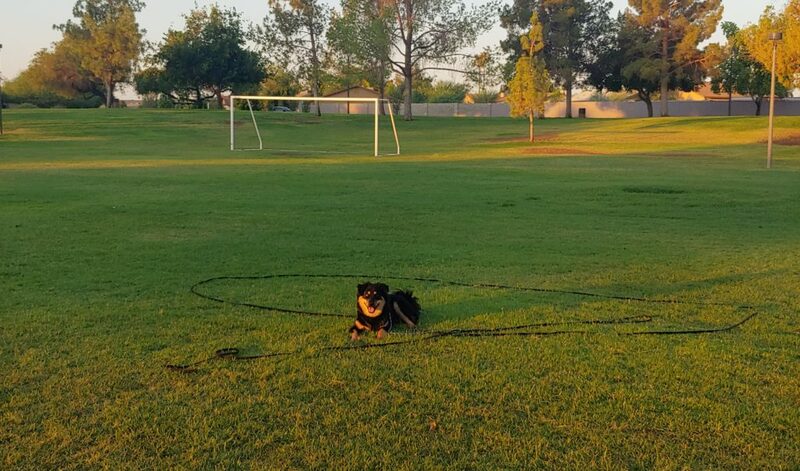 He responds to her using the collar every time now, even at close to a half of a mile away. Their relationship couldn’t be better and Karen is so happy knowing that Bodhi will one day soon be her very own helper. I came to the valley for the winter with my 8 month old standard poodle. 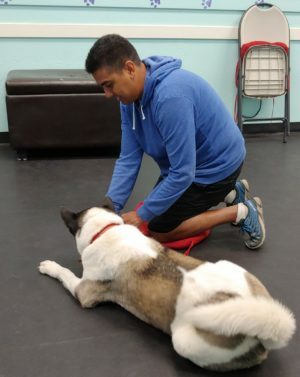 I was needing to get a trainer that was not only willing to train my Bodie but also myself. Gabby not only is awesome with Bodie, she can explain the different techniques & the reason why to perfection. If I have a question I can text her & she will answer me in a timely manner. I know that we have the best trainer that there is and for that I am very grateful! I think Gabby is the BEST!!!!! 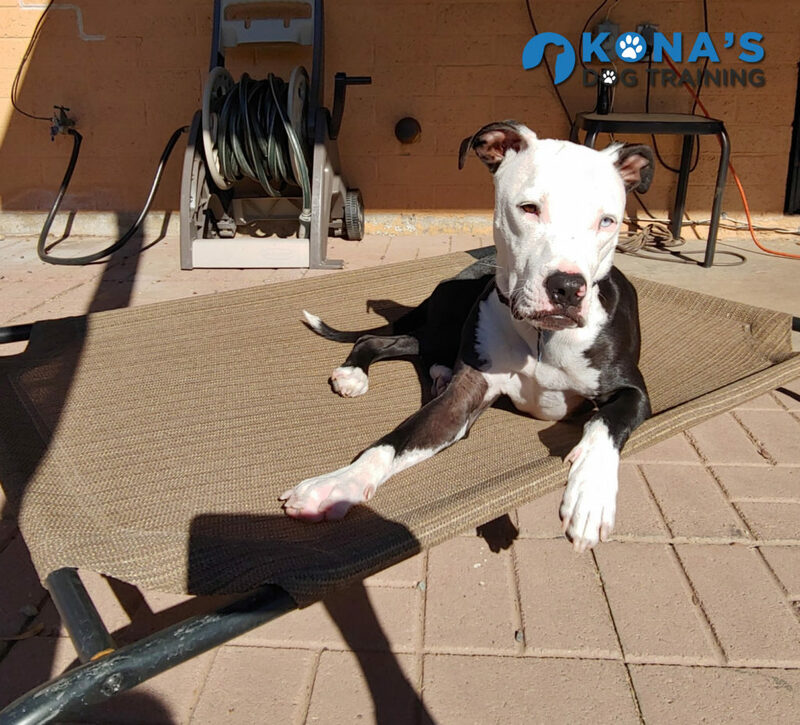 Mollie and Justin, from Tempe, AZ, first contacted us a week after they adopted their new pitbull mix, Jahseh from the county. After we sat down together and talked about what they might expect at home with Jahseh they decided to sign him up for our Boarding School program. They were beginning to see behaviors that they didn’t like and wanted to give him a good start in their home. They wanted him to listen better inside and outside the home, calm him down and work on his reactions around other dogs while on leash. Jahseh was not aggressive while in public, but he made very loud and uncomfortable sounds when seeing another dog in public. Jahseh was dropped off for his boarding school stay and right off the bat displayed his signature sounds and excitement that was over the top. Very quickly we found out that Jahseh was very food motivated and could learn very fast. 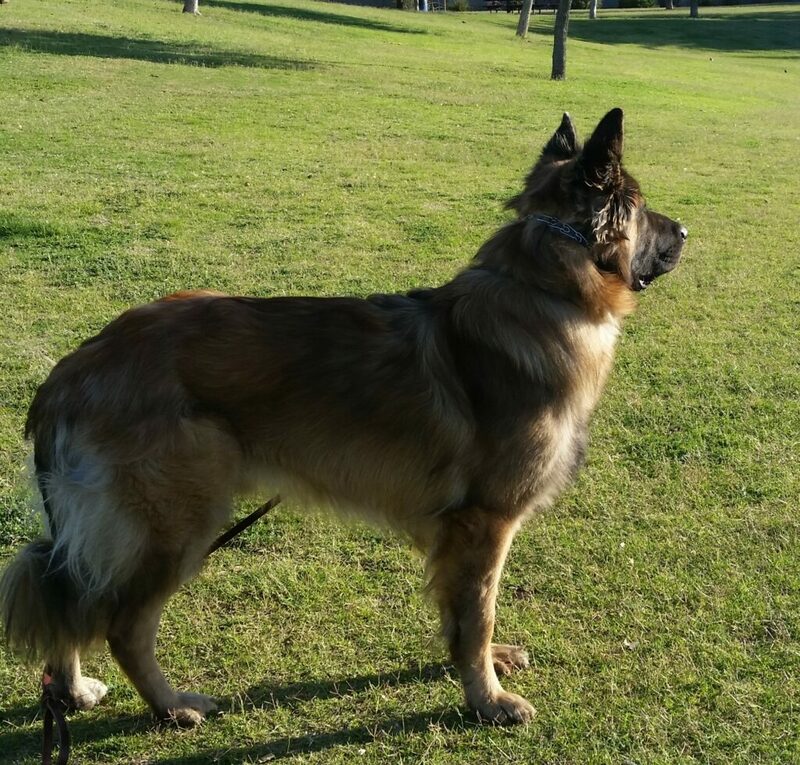 We started to get him to focus and calm his mind and listen well even around other dogs. Jahseh started to “come when called” after only a couple of days even when other dogs were off leash. 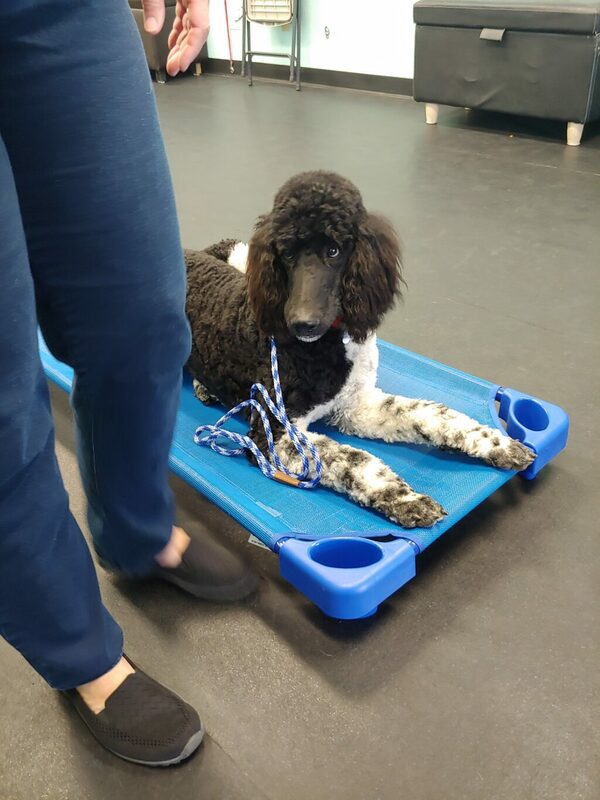 Jahseh even learned how to walk on the dog treadmill so fast that it became his favorite new exercise, so much so that his parents got one to put in their home for him to walk on. This is a great investment in our Phoenix, AZ summer months. Mollie and Justin were so surprised to see how much Jahseh had learned during his stay. 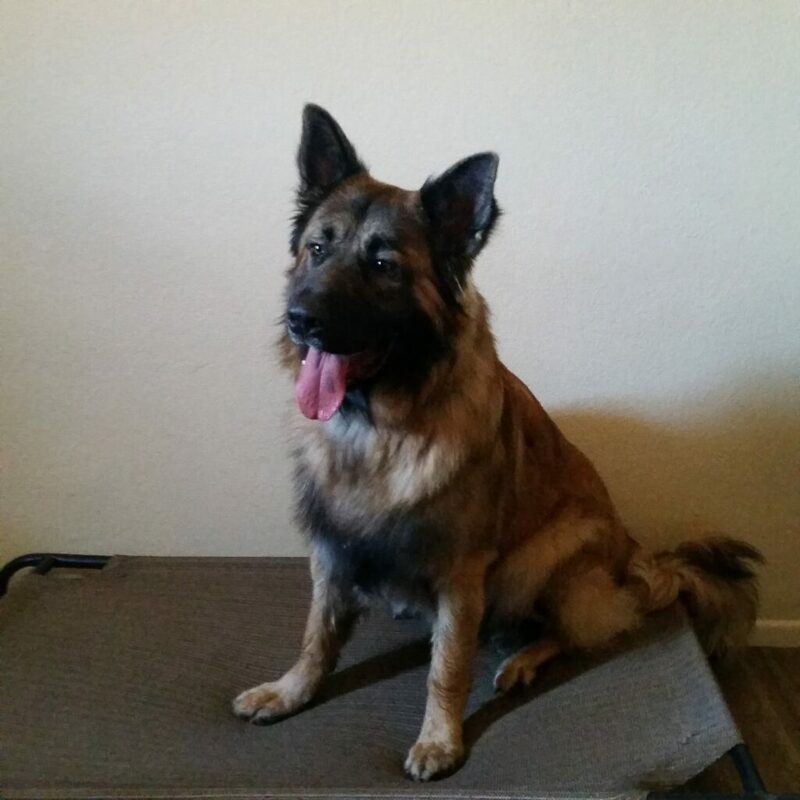 They were happy to know that he listened very well and while he still has his excited moments he is a calmer and much more relaxed dog. 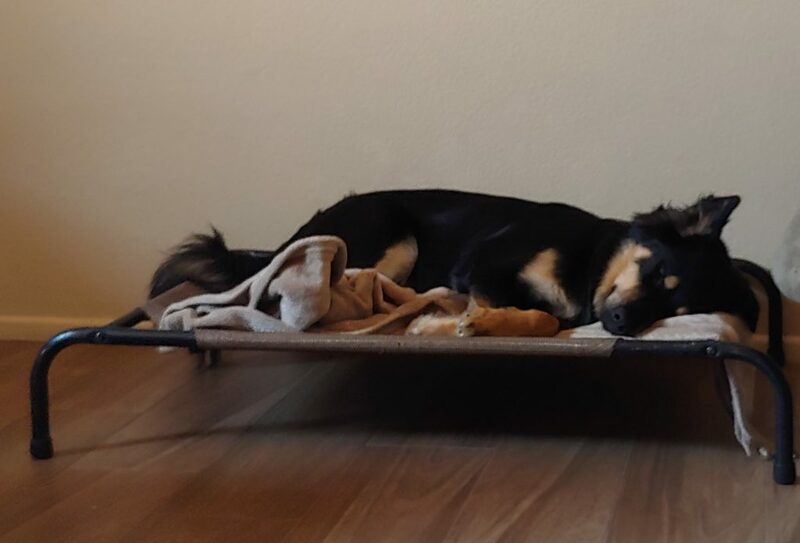 He enjoys his crate while they are at work and is happy to see them when they come home from work. He is calm at night while lounging inside their home and listens to commands the first time. While they are still getting him comfortable around all types of dogs he is able to enjoy nice hikes and walks when the weather is great. Now their biggest concern is finding a good playmate for him to build a friendship with and they are very happy about that! old puppy when he was brought home from the breeder. He had his typical needs, like potty training, teething and crate training, which Melanie and Jason worked through wonderfully. It was getting him to listen to them and respect their needs that were difficult for Jack. That’s why they started to look for help with his training and that’s when they signed up Jack for our Unlimited Program. We scheduled weekly lessons to begin to help Melanie understand why Jack was chewing and rough housing with her and her arms. We started the loose leash walking right away too. Jack was quickly becoming a big boy and the last thing that we wanted was for him to be difficult on leash. First, we taught Melanie how to stop Jack from pulling on the leash to walking next to her and then enjoying the walks they took together. He is doing well on the walks even around little yappy dogs…nothing seems to bother him now. 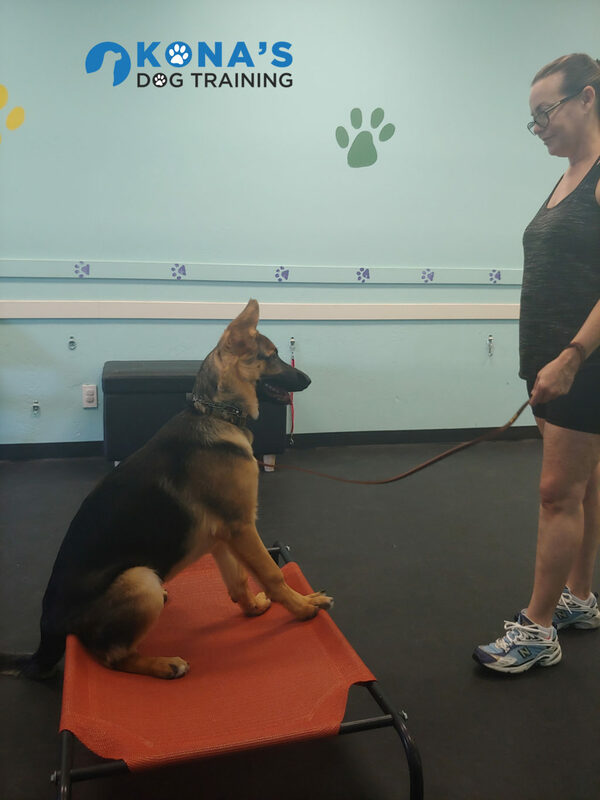 They also learned how to teach him basic obedience, which included “sit”, “down”, “come”, and “place”. 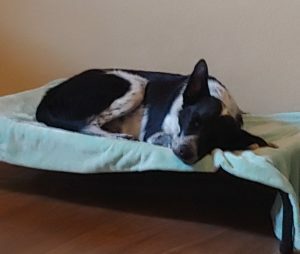 Jack is getting much better at listening when told to do something and is actually starting to enjoy his spot in the house where he finds comfort and quiet. While Melanie and Jason are the first to tell you that they feel like they can do so much more, I have found that they are doing a wonderful job raising Jack to be a good member of our community. 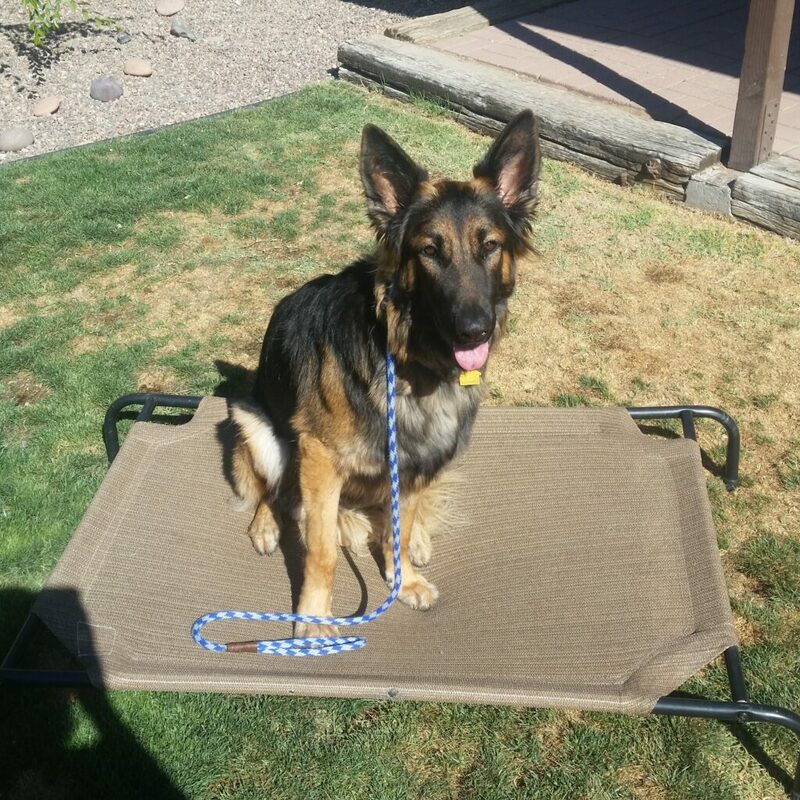 He is a friendly German Shepherd who is growing in confidence and socializing with others. 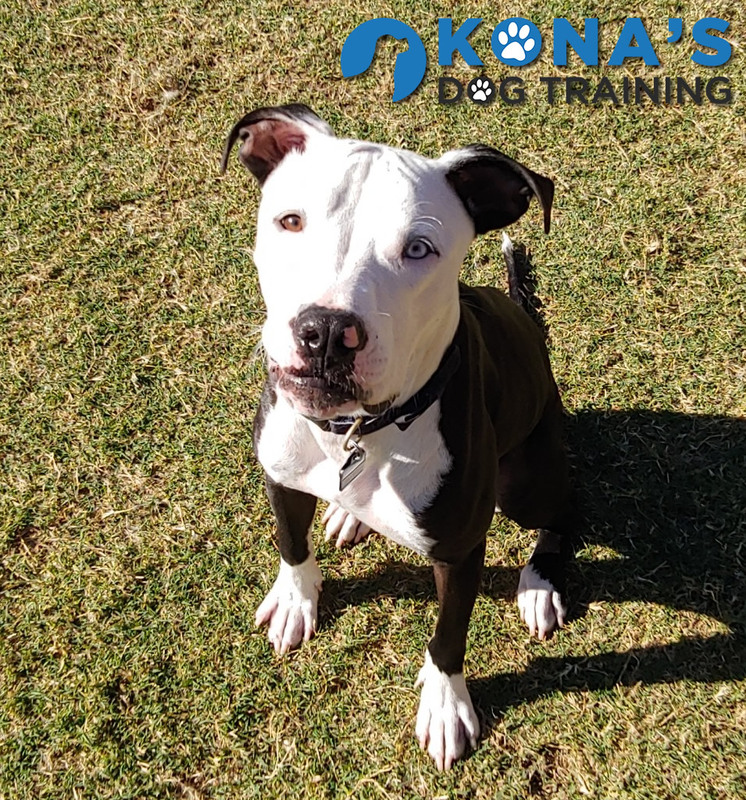 He is a great example of what training can do to help change the perception of a breed that might seem scary to some, but can be a great family pet! Lynn and Jim had called us because they had recently adopted a German Shepherd mix named Grace who wasn’t getting along great with their other dog, Chewy, a Poodle mix. 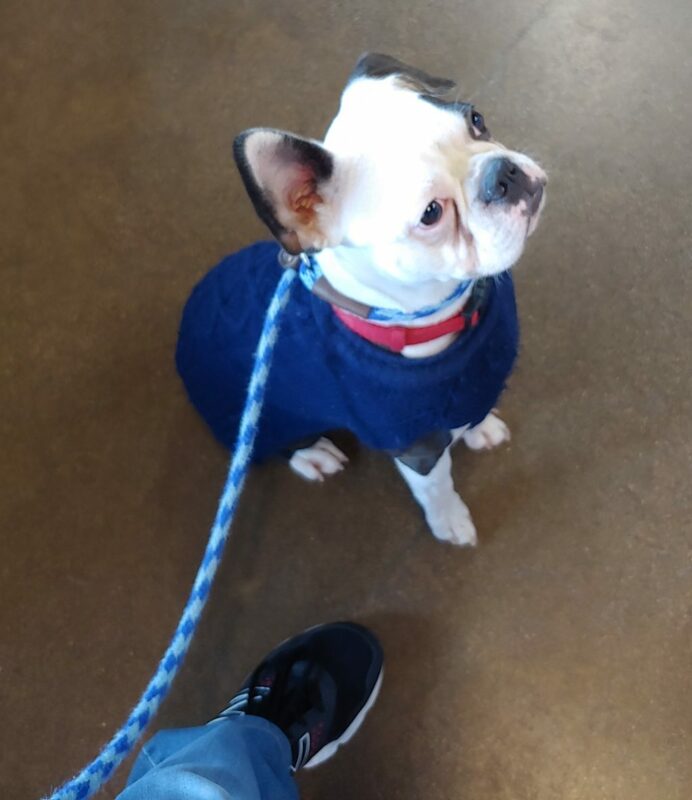 They were also hoping to get Grace to listen better and walk nicely on a leash because she didn’t have any training before they adopted her. Walking for Lynn felt like losing an arm every time Grace pulled on the leash and Grace didn’t understand manners around other dogs. After sitting down together, Lynn and Jim signed Grace up for our Boarding School Program. could rest and relax. 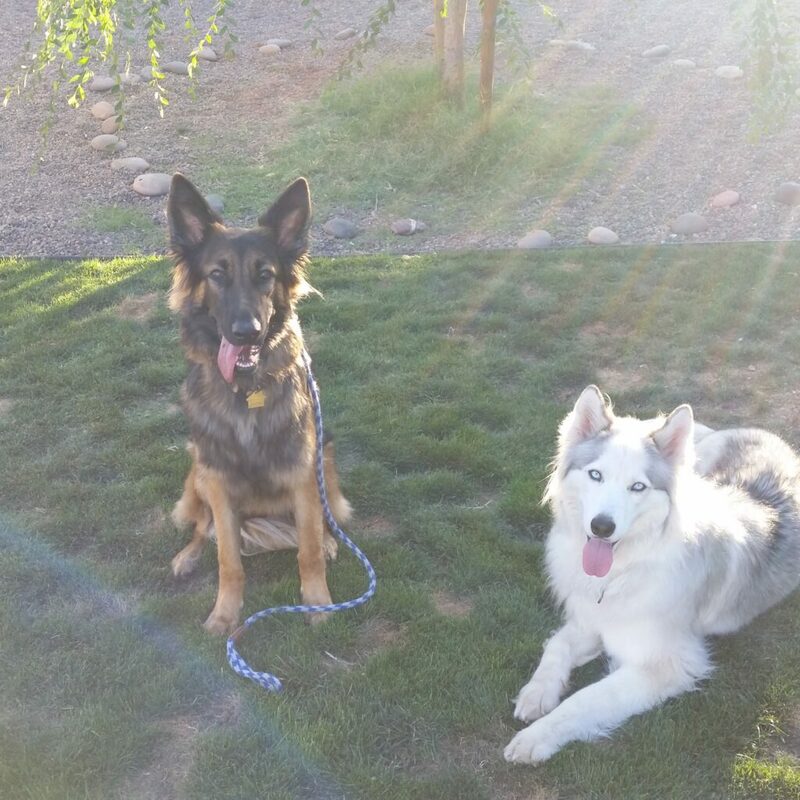 Grace listens to commands, walks wonderfully on leash and plays better with her roommate, Chewy. She also has great play dates with other dogs in the neighborhood. Lynn couldn’t be happier with Grace’s training. Not only does she get to hang out with Grace knowing she won’t go overboard, she also understands how to better communicate with Grace and Chewy. She practices the commands in every place possible and goes on hikes in the early morning hours. For Lynn, Grace went from being a nuisance for Chewy to a companion that can be enjoyed every single day for the rest of their lives! 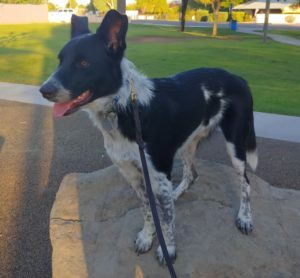 Murray and Murene from Tempe, AZ first called us because they needed some help getting their new rescue Border Collie mix, Max under control. 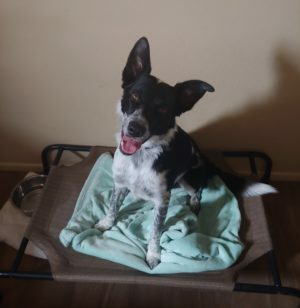 They adopted Max because they had previously had a great Border Collie who was great at listening to commands and was patient and calm, but was able to enjoy lots of play time and adventures. They were hoping for that when Max came into the family, but it wasn’t as smooth sailing with him. He had no manners, couldn’t walk on a leash without pulling like a freight train and would steal objects from furniture or counters every chance he got. Murene and Murray also thought he was a nuisance to their neighbors because if his obsessive barking at the other dogs across the fence. After calling and scheduling a visit with us, Murene and Murray signed Max up for the Boarding School Program. Max was very happy to be dropped off to start school, but then quickly realized that school meant work ;). 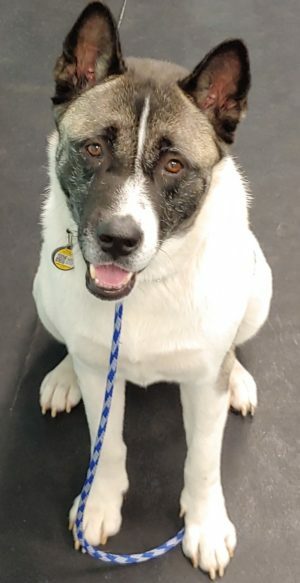 Max enjoyed his time socializing with the other dogs that stay here and he did well learning commands like “place”, “down”, “come” and “sit”. He also quickly learned how to walk nicely on a leash without pulling. While Max did protest his new school lessons he actually found out that learning can be a lot of fun and learned to respect the decisions humans made while still being the vivacious and boisterous dog is always was. Murene and Murray knew they would have a lot of work to do when Max got home, but couldn’t have been happier with the results of his board and train stay. He was calmer during times when they couldn’t play with him and enjoyed spending quality time with him when they enjoyed a cup of coffee. They are also able to enjoy a nice walk around their neighborhood which is the first time in a while that they could actually see it. Now that Murene and Murray know how to communicate with Max they can take his training to wonderful places.